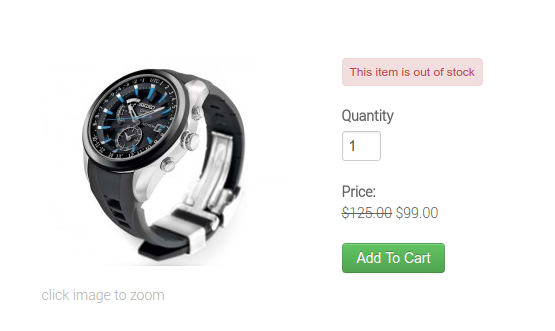 If you don't have inventory on hand for a particular product and a customer clicks the Add To Cart button, they will see a message that says the product is out of stock. 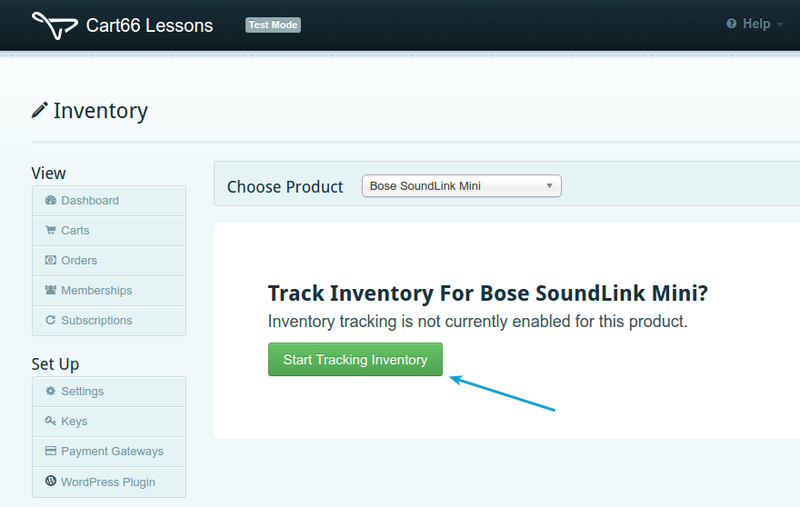 The first thing you need to do is enable inventory tracking for any products for which you'd like to track inventory. Simply click on the Inventory tab, select the product you want to work with, then click the Start Tracking Inventory button. If you are selling a product, like a watch, that doesn't have any required variations, managing inventory is as easy as simply typing in the number of items you have in stock. Add: You can add an amount to your current level of inventory by selecting the Add button, entering the amount you are adding then clicking save. For example, if you are selling Solar Watches and you have have 5 of them in stock and you get a shipment of 10 more. You can add 10 items to the 5 you already have for a total of 15 Solar Watches in stock. Set: You can set the inventory to a specific amount - regardless of how many items are currently in stock. Click the Set button, enter the exact amount of inventory you have in stock and click save. 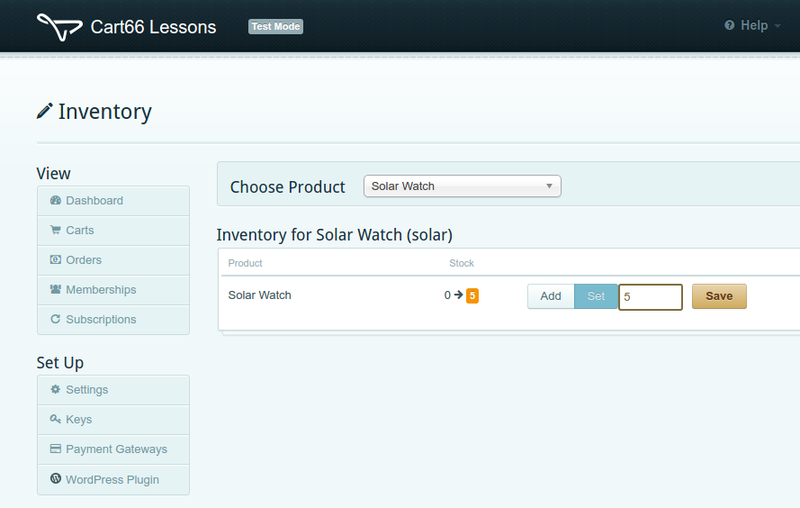 In this example, we will set the inventory for our Solar Watch to 5. Before you click save, you can see the quantity that you had, what you will have (in orange) and when you click save the number in orange will be your current level of inventory for the product. You can manage inventory down to the product variation level. 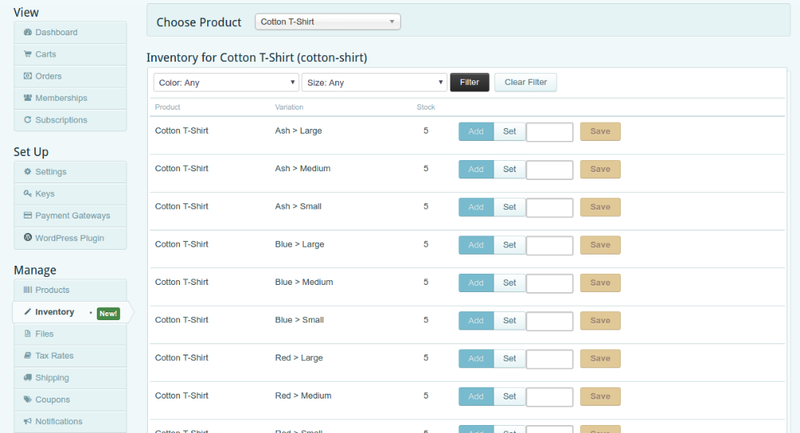 For example, if you sell t-shirts, you can control inventory for Large, Blue shirts. Every combination of required variations can have an inventory level. Optional variations, product options that do not have to be selected in order to buy the product, are not included as part of inventory management. Suppose we sell a Cotton T-Shirt that comes in 3 sizes (Large, Medium, and Small) and 3 colors (Blue, Ash, and Red). Every combination of every required variation can have it's own inventory level. Here you can see we have set an inventory amount of 5 for each combination of the required variations. The list can get rather long when dealing with lots of different combinations of variations. Suppose you just want to work with your Blue shirts. You can filter the list down to only show the Blue shirts by selecting Color: Blue then clicking the Filter button. Now we are looking at the inventory for just the Blue Cotton T-Shirts. Inventory is only reduced when an item is successfully purchased. Adding a product to the shopping cart does not reduce inventory levels. This is because Cart66 saves the contents of your customers shopping carts indefinitely. If a customer adds a product to their cart, they can leave your site and come back days later and the item is still in the cart. For this reason, inventory is only reduced after a successful sale. This means that there can be more items in your customers shopping carts than you have in inventory. So Cart66 checks inventory levels at two different times. First, the inventory is checked when the product is added to the cart. A product will not be added to the cart if you do not have enough inventory on hand to fulfill the order. A second inventory check is done just before checkout. If an item has gone out of stock after the item was added to the cart but before the customer checks out, the customer will be notified that the item is no longer in stock.